Various oddments from your stash and needles to suit. You can use absolutely anything from the finest linen to the glitziest, fuzziest novelty yarn imaginable! I used 550gms dk weight wools and cottons (approximately 1100m/ 1210 yards) and 4mm needles for a 5 ft wide shawl with fringe. Any gauge to suit your yarn. Repeat rows 57 – 92, adding 2 more repeats of the section between the square brackets each time you repeat the 36 rows. 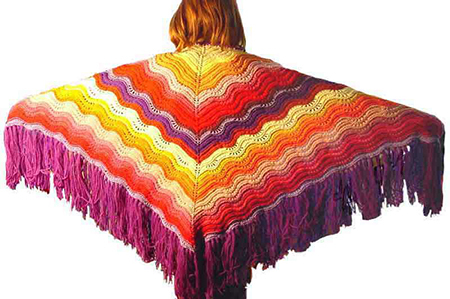 The recipient’s height for a full size shawl. For example, this shawl is for my daughter who is 5ft tall so I made her shawl 5ft wide across the top. The next chart is shown sideways. You will need to print it over several pages and stick it back together as it is very wide. Chart for rows 21-56. 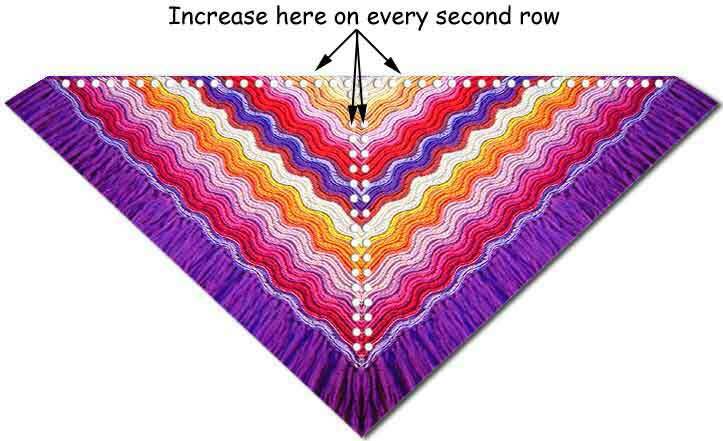 Add two repeats of the shaded section for rows 57 to 92 and so on, each time you work through the chart until your shawl is wide enough. Darn in all loose ends. Work a row of double crochet (US single crochet) into the yarn over eyelets across the top using a crochet hook 2 sizes larger than the needles you used to knit your shawl (to compensate for the extra length). Add a fringe if desired. For a head scarf, make a twisted cord 30 – 34 inches long and thread it through the eyelets across the top of the scarf. Copyright Sarah Bradberry July 20th 2004. Charts added December 14th, 2014. All rights reserved. OMG!!! 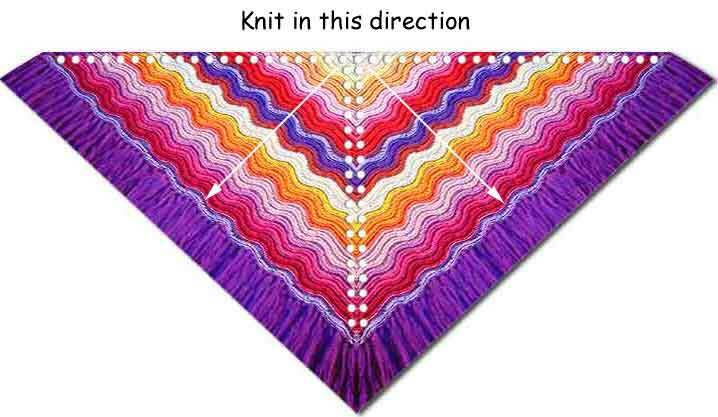 i’m a newbie knitter, been crocheting for over 40 years….i’m a *visual* when it comes to patterns, i do so much better when i can *see* it vs reading a pattern….. i’ve been wanting to do a triangle knit shawl, but none of what i’ve looked at either make sense, or just appear too intimidating…. this is PERFECT!!!!! You don’t have to have one if you’re knitting a small kerchief sized triangle, for a head scarf for example. However if you’d like to knit a full size shawl a circular needle is the only way I’ve found you can keep all the stitches from falling off the end. It’s also a lot more comfortable for your hands as the weight of the knitting can sit in your lap instead of being held up by your hands all the time.